General Physical Prep and Specific Physical Prep… or Why riding a road bike is fundamentally different for mountain bikers than roadies. In my last blog post I talked about the importance of being able to deal with compromises, especially with your training program. One of the real dangers, however, is denying that something carries any compromises with it which leads to a fall sense of confidence in its effectiveness. Finding the balance between the two is the key to an effective program, especially if you have a limited amount of time to train and need everything you do to be as effective as possible. In our sport the best example of this is the use of road biking as a training tool. For a lot of riders the answer to “how do I get better at mountain biking” is to spend hours on a road bike. Because of the success seen with this approach by roadies the assumption is that the same approach will work for us. Now, this isn’t to say that there is no value in riding a road bike for mountain bikers. But if you don’t understand General Physical Prep (GPP) vs. Specific Physical Prep (SPP) and how it fundamentally changes what riding a road bike does for us on the trail then you can waste a lot of time and effort. After posting my article on How To Use Road Riding as a Mountain Biker I realized that one of the things that easily gets forgotten in the never ending debate for the “best” training method or program is whether the method being discussed is General Physical Prep or Specific Physical Prep in relation to your goals as a mountain bike rider. This is vitally important, though, because blind application of training methods from one sport to another can result in a misapplication of that method for another sport. In other words, what qualifies as “Specific” for one sport often qualifies as “General” for another. Specific Physical Prep is also known as Sport Specific Training in some circles and refers to everything you do that mimics the specific demands of your sport, including playing the sport itself. For a mountain biker this includes everything done on your mountain bike since that is the only way you can truly mimic the demands of the sport. If you compete then this would narrow it even further to riding a bike very similar to the one you compete on. For us this type of training would most often be trail rides, cardio training on your mountain bike and skills drills. General Physical Prep refers to everything you do that doesn’t relate directly to your sport. For a mountain biker this would include strength & power training in the gym, mobility work and cardio using some other method besides riding your mountain bike. While it would seem like Specific Physical Prep is the place to spend most of your time the truth is that it is built on the foundation of General Physical Prep, making it an important and often overlooked part of a riders program. 1) If you aren’t on your mountain bike – specifically the bike you compete on – it can not qualify as Specific Physical Prep. This means that riding a road bike counts as “General” for a mountain biker, not as “Specific” as is often assumed when using it. This confusion stems directly from the fact that, for the roadie, riding a road bike counts as Specific while for a mountain biker it counts as General. 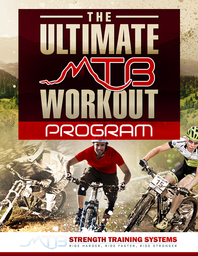 A roadie’s cardio program calls for them to spend a great deal of time on the bikes they ride/ compete on so that they are working on their Specific Physical Prep but when a mountain biker uses the same approach he is working on his General Physical Prep. This fundamentally changes the effects of riding a road bike and, if not understood and used properly, can result in a potential flaw in the overall approach to improving as a mountain biker. 2) If all you do is Specific Physical Prep you are slowing your own development since your General Physical Prep supports your Specific Physical Prep. This is where having a strength & power program geared towards the foundational movements needed to ride your bike more efficiently and a mobility program geared towards restoring the imbalances caused by repetitive movements on the bike would fall. The stronger and wider the General Physical Prep base the higher you can build the point of your Specific Physical Prep training and ultimately your performance on the trail. 3) While spending time on a road bike building your General Physical Prep isn’t bad, I’m not sure that it is the best use of that time. Since riding a road bike is too far removed from a mountain bike to count as Specific Physical Prep but it is close enough to carry a lot of the same potential overuse injuries I personally feel that trail running and swimming actually present better alternatives. These activities present the body with different movement challenges and actually present a greater cardio challenge since you are not as efficient with those movements. This means that you don’t have to work as “hard” to see the same general cardio benefits and you won’t be piling onto the same general movement patterns used on your mountain bike. This is another reason I recommend that if you want to ride your bike then make it Specific Physical Prep and hop on your mountain bike, even if you are going to be riding on the road. By understanding the differences between General Physical Prep and Specific Physical Prep you gain a better perspective on how to apply different training methods and programs. You can’t become a good mountain biker in the gym or on a road bike- you have to get out on the trail. However, you’ll never be as good as possible if you only trail ride and never incorporate other forms of training. Finding the balance between the two is the key to an effective program, especially if you have a limited amount of time to train and need everything you do to be as effective as possible. How to instantly improve your Turkish Get Up...with a shoe. How and where does, BMX racing, Dirt jumping, street and park fit in here? I spend my entire spring on a bmx or dj bike as the trails in MN don’t open till mid may or early june typically but the skate parks and street are open in march usually and the dirt jumps and pump tracks in April or May and we have Indoor BMX tracks and skate parks to hit up in the winter. I actually hardly ever ride my road bike unless riding to work, which I plan to do more this summer. I think my point is more about choosing your cardio program’s training weapon wisely. What your describing would fall more under “skills training” rather than cardio training simply because it is a bit harder to quantify and track. There is a cardio benefit to what your doing but not the same as a dedicated cardio program, in which case I would argue that you should ride your mountain bike or do something completely removed like trail running or swimming. BTW, I think that more riders should spend some time doing what you’re doing in the off season since skills like that are so valuable on the trail but ideally you’d have a balance between the skills work and the cardio training. While I agree with everything you have said I am going to play the devils advocate here. I am into my second XC race season and here in the southeast we have incredibly fast trails that aren’t very technical. Last season I did not ride my road bike at all and did a strength routine mixed with a lot of trail riding. My performance was so so. I asked the guys that were beating what they did for training and all 4 of them said they spent most of their time on the road bike. This year same story. One of the guys beating me this is his first year on a mtn bike but been road racing for years. I can blow their doors off in the technical spots but as soon as it smooths out they are right back up to 18mph and I am left in the dust. All that said there has to be some merit to road riding for the style trails we have hear or a road guy that has never raced a mtn bike wouldn’t be able to beat a guy that has been riding/ racing for 10+ years. Again, the point is not about training for the specifics of your race tracks – in which case it sounds like a good case for riding on the road as part of your training – but about choosing your cardio training weapon wisely. Any ride or workout you can do on a road bike you can do on your mountain bike and you get the added benefits of using the same bike you race on. A road bike is lighter and has much different body position and geometry and so any fitness gained won’t be as specific as the same fitness gained on a bike that is the same weight, body position and geometry as what you race on. Train to be able to go 18 mph on the flats, I’m just saying that you should stick with the weapon you use in battle or use something entirely removed from cycling like running or rowing. A road bike isn’t specific enough to count as SPP but it carries the same overuse injury potential, which is why I think it should be avoided unless it is something you really want to do. Using road riding as a training tool is fine, you just don’t have to do it on a road bike and logically speaking you’d be better off using your mountain bike instead. @Liers99 – Don’t underestimate the years someone has raced, road or MTB. That in itself will supercede your skills from as you say, only your second XC season. Though you may have been riding, race experience gives a pretty good edge right off the bat, let alone the mental strength gains from those years. Plus you’re building on every season’s leg muscles. You’ve just started to build with sincerity. And, don’t forget, your competition won’t admit to ALL the training they’re doing (weights, mobility training, etc. )..I wouldn’t 😀 I used to road race as well, and when switching to MTB 4 years ago I kept trying to plug road miles and it only seemed to wear my body out. I’m a convert to James’ theory. It’s working well for me – and always keep in mind this is not a one season goal; Your training should envision gains years in the making. I have to remind myself from time to time. Would trail riding a single speed 26″ bike be considered GPP or SPP? I am currently building a 29er for XC racing, so I’m taking this year to work on my skills and build a bike to compete on. My thoughts were making my only bike a single speed would force me to become a stronger rider. Am I on the right track or should I put some gears on my old bike? Single speeds just force you to stand up more. If you hit the trail with the philosophy of standing up more then you don’t need to handicap yourself with only one gear. Don’t get me wrong, if you like single speeding then fine but using it as as training tool isn’t the best use of it unless you race single speeds. Firstly, they can ride faster on a fire road or in a straight line, but the lack of skills training means their cornering remains the same. In fact they crash more because they are capable of approaching corners faster, but with the same old skill set they come unstuck if they try to carry that speed through the corner. Roadies spend most of their time going in a straight line, mountaineer bikers spend most of their time cornering, another big difference between the two sports. Secondly, most people seems to use the road bike as extra training. So they might go from doing two 1.5 hour MTB rides and add one or two 2-3 hr road rides to their weekly schedule, in some cases doubling the amount of time they spend on a bike. Then they praise the road bike like it’s some kind of miracle device. But as James points out, if you spent that time in the gym, pool or doing something else the gains would likely be much greater. Road riding isn’t particularly time efficient. Great points, Carlos, particularly the observation about wiping out on corners. Thanks for sharing your thoughts on this with us. James – you also left out the “half-way-inbetween” category of road work. Cyclocross. My sons do both and I think the skills they are learning and SPP training they are doing “on season” for cross is greatly beneficial for them when they go “on season” for XC MTB. My oldest just started private training with a CX/XC specific trainer (will work with him both seasons) and a lot of the CX training plan now is built around time on a trainer (vs hours on the road) but doing drilss (Big Gear/Little Gear, intervals, etc) rather than just grinding out miles on the road. CX practice is a combo of skill drills (off camber, chicanes, running bike up hills and stairs) and endurance (hill repeats, relays, time trials). Where does your GPP/SPP line fall when mixing these two sports? If it isn’t on a mountain bike then technically it isn’t SPP. It is a tough filter for cycling people to run things through because we have been taught – mainly for marketing purposes – that you need different bikes for different things. You can do cyclo-cross but if you aren’t doing it on a mountain bike then it is GPP. The specific positions and balance points on a mountain bike create specific neural pathways, which is what your brain accesses when riding. You want those pathways to be well ingrained, which only happens by using the same tool you compete with (or as close as possible). I’m a believer in a mountain biker only riding a mountain bike for all his training and then using other sports like running (your son needs to do some running, it is an important movement skill that he doesn’t want to specialize himself out of) or swimming. The worst thing you can do is to do something “kind of like” riding your mountain bike because it isn’t specific enough to be SPP but it is close enough to create competing neural pathways which can make it harder to move as efficiently as possible when fatigued.